With over thirty years of experience in moulding the Hepworth Composites gas and electricity meter boxes are manufactured to the quality standards synonymous with our name. Our new deeper design of box permits the installation of both standard and prepayment meters without the need for any modifications to the door. Another standard feature is the use of a special fire retardant (Class II, BS 476) moulding compound in all of our meter boxes. The product is also available with a range of options to suit individual customer requirements or applications and can be branded with company names or logos. 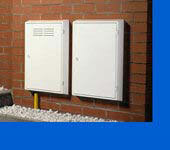 Unibox is designed for use in either ground mounted or wall mounted installations. The unique design of Unibox offers the installer flexibility and choice in the selection of meters, regulators and fittings to achieve the most cost effective solution. Unibox will accept all standard front facing index, inclined index and the latest designs of prepayment meters. Designed with the standard meter bracket Unibox offers ease of assembly with quick and safe connectionsin addition to a choice of inlet and outlet positions. Detailed assembly drawings of meter installations are available on request.